One of the most popular questions our customer service specialists answer is how to measure a blanket. You want to be sure to get it right. If a blanket is too small, it can rub or restrict movement. 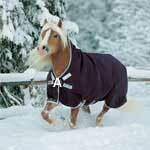 If a blanket is too large, your horse can step on it or become entangled in it. To measure your horse, start at the center of the chest (A in photos below). Then go around the widest point of the horse's shoulder and follow parallel to the ground along the side of your horse to the point of their hind end where it meets the tail (B in photos below). Blankets either run in 2" increments (American sizing: 66", 68", 70", etc) or 3" increments (European sizing: 66", 69", 72", etc). If your horse falls between sizes, we always recommend going up to the next larger size. You might also want to think about whether you are going to be layering this blanket over other blankets (if so, add an inch or two), or if it's a dress sheet, if you'll be draping it over your saddle. If you have questions, please feel free to call to talk to a customer service representative. Curvon (Baker Blankets): Baker blankets run true to size. Go from the center of the chest (A) to the point of the rump (B). Horseware (Rambo, Rhino, Amigo, Triple Crown): Horseware recommends measuring from the center of the horse's chest to the center of the tail and then subtracting 4 inches. We have many customers who have told us they prefer to subtract 2 inches rather than 4 for a better fit (which equates to the measurement from point A to B above). Blue Ribbon: Blue Ribbon blankets run very true to size. Measure from the center of the chest to the point of the hind end where it meets the tail (point A to point B). If the item is a ringside item that you will be placing over a saddle (scrims, dress sheets, knits, etc), they recommend going up one size. 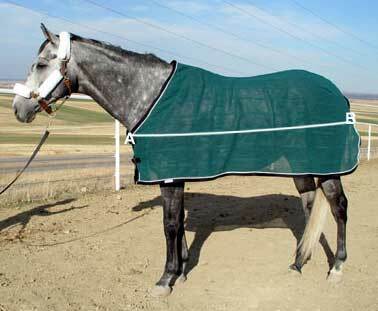 Saratoga Horseworks: Saratoga fly sheets run true to size (measure point A to point B). If you're inbetween, go to the bigger size. This chart is a helpful guide to the blanket size your horse may take according to their height. Remember, this is only a guide. The length of your horse's back and the width of body will impact the size your horse needs. We always recommend measuring your horse.